Fourth-ranked Laguneros (16-20) were very close to win a game against second ranked Mineros (27-10) on Wednesday. Mineros managed to secure only three-point victory 92-89. However their fans expected easier game. Mineros looked well-organized offensively handing out 23 assists. American-Puerto Rican point guard Denis Clemente (183-86, college: Kansas St.) orchestrated the victory by scoring 23 points and 9 assists. American guard Jordan Williams (198-92, college: N.Texas) contributed with 17 points and 8 rebounds for the winners. Jamaican-American guard Akeem Scott (185-83, college: High Point) replied with a double-double by scoring 16 points, 14 rebounds and 7 assists for Laguneros. Mineros have a solid three-game winning streak. They maintain second position with 27-10 record having just ten point less than leader Fuerza Regia. Newly promoted Laguneros keep the fourth place with 20 games lost. They share the position with Correcaminos. Mineros' supporters look forward to an exciting derby game next round, where their team will travel locally in to the arena . Important game to mention about took place in Guanajuato. Fifth ranked Abejas (17-20) saved a 1-point victory at home edging 3rd ranked Aaguacateros (19-15) 84-83 on Thursday evening. American guard Spencer Williams (188-95, college: Wooster) scored 22 points and 7 assists to lead the charge for the winners and Yancy Gates chipped in 17 points and 12 rebounds during the contest. The former international power forward Arim Solares (202-83) responded with 21 points. Abejas have a solid four-game winning streak. They maintain fifth position with 17-20 record. Aaguacateros lost fourth consecutive game. They keep the third place with 15 games lost. Abejas will play against Angeles (#7) in Puebla in the next round. Aaguacateros will play at home against the league's second-placed Soles (#2) and it may be a tough game between close rivals. A very close game took place in Aguascalientes between Angeles and Panteras. Seventh ranked Angeles (12-23) got a very close victory on the road over 4th ranked Panteras (17-18). Angeles managed to escape with a 1-point win 99-98 on Thursday evening. Filiberto Rivera notched a double-double by scoring 21 points, 6 rebounds and 14 assists to lead the effort. 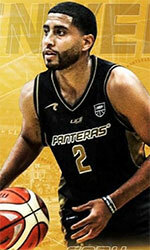 Even a double-double of 19 points and 12 assists by Hameed Ali did not help to save the game for Panteras. Newly promoted Angeles maintains seventh position with 12-23 record. Panteras at the other side keep the fourth place with 18 games lost. Angeles will meet at home higher ranked Abejas (#5) in the next round and it may be quite challenging game. Panteras will have a break next round. An interesting game for Mineros (27-10) which hosted in 4th ranked Laguneros (16-20). Second ranked Mineros managed to get a 5-point victory 90-85. The best player for the winners was Denis Clemente who scored 24 points, 8 rebounds and 9 assists. Laguneros' coach rotated ten players in this game, but that didn't help. Mineros have a solid three-game winning streak. They maintain second position with 27-10 record having just ten point less than leader Fuerza Regia. Newly promoted Laguneros keep the fourth place with 20 games lost. Mineros will have a break next round. Laguneros will play at home against Huracanes (#7) and hope to win that game. The game in Tampico was also quite interesting. 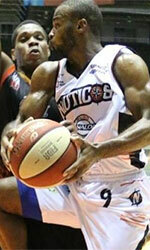 Fourth ranked Correcaminos (16-20) played at the court of 7th ranked Huracanes (6-30). Correcaminos managed to secure a 8-point victory 121-113 on Thursday. Kennedy Jones orchestrated the victory by scoring 26 points and 6 assists. Correcaminos maintains fourth position with 16-20 record, which they share with Laguneros. Huracanes lost sixth consecutive game. Newly promoted team keep the seventh place with 30 games lost. Correcaminos will face Santos (#6) in San Luis Potosi in the next round. Huracanes will play on the road against Laguneros in Torreon and hope to win that game. In the last game of round 38 Lenadores beat Santos on the road 100-93. The most impressive performance of 38th round was 28 points and 6 rebounds by Jose Zesati of Angeles. Fourth-ranked Laguneros (16-20) were very close to win a game against second ranked Mineros (27-10) on Wednesday. Mineros managed to secure only three-point victory 92-89. However their fans expected easier game. Mineros looked well-organized offensively handing out 23 assists. American-Puerto Rican point guard Denis Clemente (183-86, college: Kansas St.) orchestrated the victory by scoring 23 points and 9 assists. American guard Jordan Williams (198-92, college: N.Texas) contributed with 17 points and 8 rebounds for the winners. Jamaican-American guard Akeem Scott (185-83, college: High Point) replied with a double-double by scoring 16 points, 14 rebounds and 7 assists and Nigerian-American power forward Ike Okoye (206-86, college: Boise St.) added 12 points and 11 rebounds in the effort for Laguneros. Four Mineros and five Laguneros players scored in double figures. Mineros have a solid three-game winning streak. They maintain second position with 27-10 record having just ten point less than leader Fuerza Regia. Newly promoted Laguneros keep the fourth place with 20 games lost. They share the position with Correcaminos. Mineros' supporters look forward to an exciting derby game next round, where their team will travel locally in to the arena . The game in Tampico was also quite interesting. Fourth ranked Correcaminos (16-20) played at the court of 7th ranked Huracanes (6-30). Correcaminos managed to secure a 8-point victory 121-113 on Thursday. American guard Kennedy Jones (188-89, college: Arlington Baptist) orchestrated the victory by scoring 26 points and 6 assists. International guard Jose-David Estrada (194-94, agency: Pro Sports) contributed with 29 points (was perfect 7-for-7 from the free throw line) for the winners. U.S. Virgin Islands-American forward Jamaal Samuel (206-93, college: La-Monroe) replied with a double-double by scoring 23 points, 14 rebounds and 5 assists and naturalized American guard Martin Samarco (190-85, college: Bowling Green) added 31 points and 8 rebounds in the effort for Huracanes. Both teams had five players each who scored in double figures. Correcaminos maintains fourth position with 16-20 record, which they share with Laguneros. Huracanes lost sixth consecutive game. Newly promoted team keep the seventh place with 30 games lost. Correcaminos will face Santos (#6) in San Luis Potosi in the next round. Huracanes will play on the road against Laguneros in Torreon and hope to win that game. No shocking result in a game when third ranked Lenadores (23-14) beat 6th ranked Santos (12-25) in San Luis Potosi 100-93 on Thursday. Lenadores made 21-of-26 free shots (80.8 percent) during the game. They looked well-organized offensively handing out 24 assists. American-Lebanese power forward Jarrid Famous (209-88, college: S.Florida) orchestrated the victory with a double-double by scoring 30 points and 10 rebounds. American-Puerto Rican Javier Mojica (190-84, college: Cent.Conn.St.) contributed with a double-double by scoring 14 points, 11 rebounds, 7 assists and 4 steals for the winners. American forward BJ West (211-89, college: Jackson St.) replied with a double-double by scoring 23 points and 18 rebounds and his fellow American import forward Lyonell Gaines (198-93, college: Morehead St., agency: Best of You Sports) added 27 points, 9 rebounds and 5 assists in the effort for Santos. Five Lenadores and four Santos players scored in double figures. Lenadores have an impressive six-game winning streak. Newly promoted Lenadores maintains third position with 23-14 record having just six point less than leader Fuerza Regia. Santos lost fifth consecutive game. They keep the sixth place with 25 games lost. Lenadores will face league's leader Fuerza Regia in Monterrey in the next round and it will be for sure the game of the week. Santos will play on the road against Correcaminos (#5) in Ciudad Victoria and it may be a tough game between close rivals. An interesting game for Mineros (27-10) which hosted in 4th ranked Laguneros (16-20). Second ranked Mineros managed to get a 5-point victory 90-85. Mineros players were unselfish on offense dishing 26 assists. The best player for the winners was American-Puerto Rican point guard Denis Clemente (183-86, college: Kansas St.) who scored 24 points, 8 rebounds and 9 assists. American forward Nick Harney (203-92, college: Fairmont St.) chipped in 22 points (on 10-of-13 shooting from the field). American forward Mychal Ammons (198-92, college: S.Alabama) produced 22 points and 8 rebounds and Jamaican-American guard Akeem Scott (185-83, college: High Point) added 18 points and 6 rebounds (was perfect 7-for-7 from the free throw line) respectively for the guests. Both teams had four players each who scored in double figures. Laguneros' coach rotated ten players in this game, but that didn't help. Mineros have a solid three-game winning streak. They maintain second position with 27-10 record having just ten point less than leader Fuerza Regia. Newly promoted Laguneros keep the fourth place with 20 games lost. Mineros will have a break next round. Laguneros will play at home against Huracanes (#7) and hope to win that game. Important game to mention about took place in Guanajuato. Fifth ranked Abejas (17-20) saved a 1-point victory at home edging 3rd ranked Aaguacateros (19-15) 84-83 on Thursday evening. Abejas made 18-of-23 charity shots (78.3 percent) during the game. American guard Spencer Williams (188-95, college: Wooster) scored 22 points and 7 assists to lead the charge for the winners and the other American import power forward Yancy Gates (206-89, college: Cincinnati) chipped in 17 points and 12 rebounds during the contest. 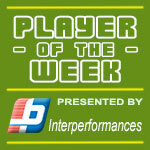 Four Abejas players scored in double figures. The former international power forward Arim Solares (202-83) responded with 21 points and swingman Kareem Rodriguez (192-88) scored 21 points. Abejas have a solid four-game winning streak. They maintain fifth position with 17-20 record. Aaguacateros lost fourth consecutive game. They keep the third place with 15 games lost. Abejas will play against Angeles (#7) in Puebla in the next round. Aaguacateros will play at home against the league's second-placed Soles (#2) and it may be a tough game between close rivals. A very close game took place in Aguascalientes between Angeles and Panteras. Seventh ranked Angeles (12-23) got a very close victory on the road over 4th ranked Panteras (17-18). Angeles managed to escape with a 1-point win 99-98 on Thursday evening. Angeles shot the lights out from three sinking 14 long-distance shots on high 58.3 percentage. They looked well-organized offensively handing out 27 assists. Puerto Rican point guard Filiberto Rivera (189-82, college: UTEP) notched a double-double by scoring 21 points, 6 rebounds and 14 assists to lead the effort and center Jose Zesati (205-94) supported him with 28 points and 6 rebounds. Five Angeles players scored in double figures. Even a double-double of 19 points and 12 assists by American guard Hameed Ali (188-93, college: Texas A&M-CC) did not help to save the game for Panteras. His fellow American import forward Stedmon Lemon (198-92, college: Johnson C. Smith) added 28 points for the hosts. Newly promoted Angeles maintains seventh position with 12-23 record. Panteras at the other side keep the fourth place with 18 games lost. Angeles will meet at home higher ranked Abejas (#5) in the next round and it may be quite challenging game. Panteras will have a break next round.